Many colorfully painted wooden structures stood around the room Oct. 30 inside the University of Miami’s Kislak Center, each filled with a different story and made with carefully crafted figurines. Spanish words buzzed around the room as guests commented on the artwork. Most attendees were seasoned art historians and professors familiar with these wooden pieces, known as retablos. The artist behind the whole display, Nicario Jimenez, watched from the side, reserved and smiling as guests pondered his work and friends shared their praise. Jimenez is a Peruvian artist renowned for his fresh take on retablos. 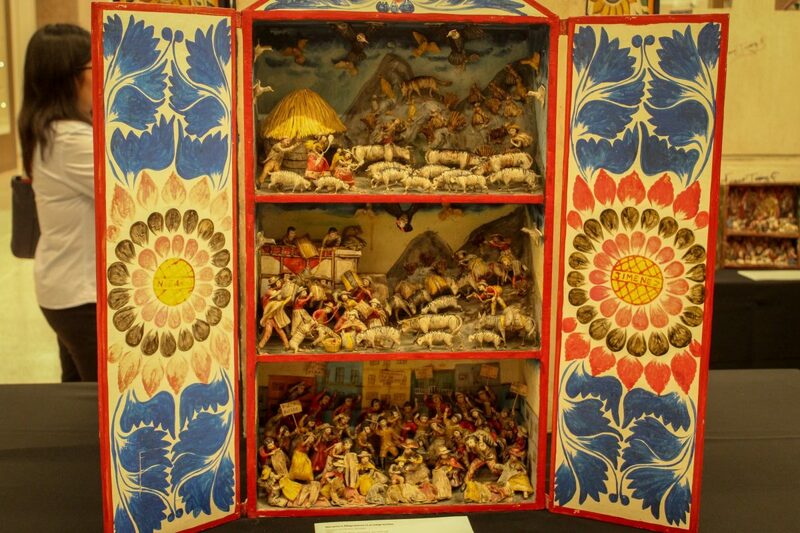 All of his intricate and colorful retablos consist of wooden and often multi-compartmental structures that vary in size and have different scenes displayed inside through the use of small, handcrafted figurines. 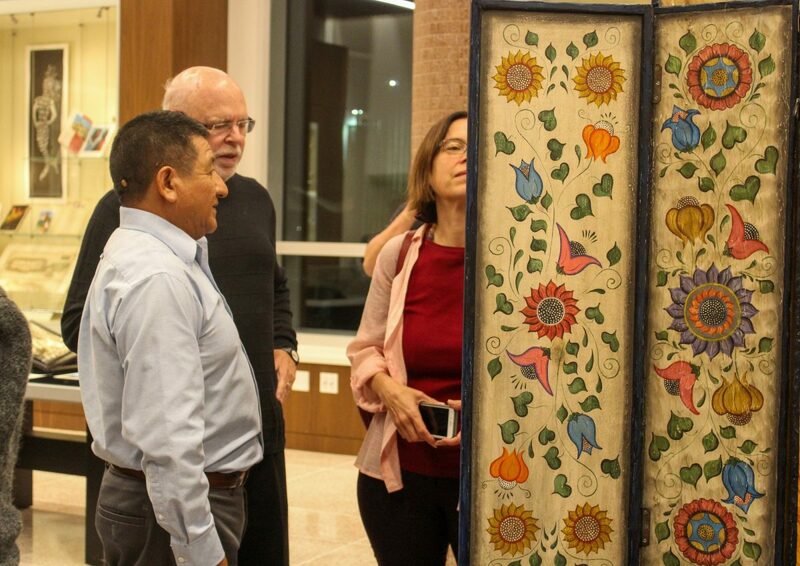 At the event, guests walked around to explore these art pieces before listening to a panel discussion between several experts and Jimenez himself about his retablos. They spoke about the art’s significance in today’s political climate, focusing on what the displays convey about immigration in America. Carol Daman, one of the panelists and a professor of art history at Florida International University, spoke about the importance and ingenuity of Jimenez’s work. Retablos are a very important part of Peruvian folk art. Spanish priests originally used them as portable shrines during their long journeys, but the native peoples in South America adopted retablos after colonization. Indigenous nations, including the Incas in Peru, began to use retablos to tell their own stories. 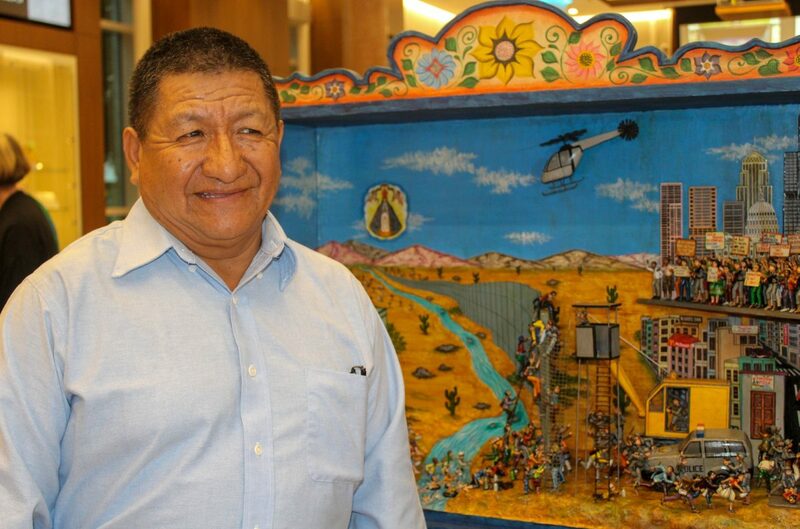 Rather than only focusing on traditional Peruvian culture, the majority of the retablos in Jimenez’s collection feature the stories of different immigrants. These retablos depict scenes addressing what Jimenez described as the poverty and strife many immigrants face in their countries of origin, the difficult process of coming to the United States and the strenuous, often menial work that they must do to survive once they get here. “I wanted to show the everyday life, and every day is not always happy for these immigrants,” Jimenez said. 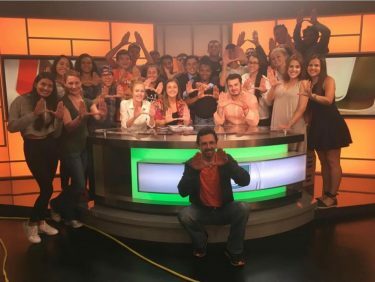 Jimenez’s work is largely critical of the American attitude towards immigrants and the common stigmas against them. One of his most recent pieces depicts the separation of families in Texas detainment centers. He said his next retablo, which he is currently working on, will be about the migrant caravan headed through Mexico to the US. Jimenez said each retablo can take up to several years to make.